Cassava cake is ground cassava with grated coconut and it’s really one of the old and authentic Indonesian desserts. You can mostly find them in the villages or on the market. The daily morning market usually sold original Indonesian desserts and cakes. They are usually cheaper than the big desserts shop and they are really delicious. The market itself is a big catastrophe, and it’s not really clean. If you don’t get used to it you might find it too dirty to walk around. 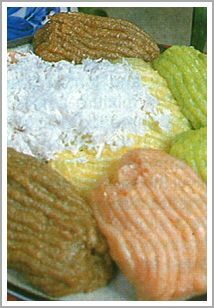 But you can find at the Indonesian market the most delicious and lovable desserts. More than you can find at the fancy supermarket. Getuk Lindri is also really easy to make. The hardest part is might be to get the spaghetti form if you don’t have pasta machine. But you can easily obtain Pasta Machine at amazon.com at low prize and I can assure you this machine comes pretty handy if you often making something in the kitchen. You can make so many things with this machine including the sheets of pastei, the delicious Indonesian dessert. 1/2 kilogram dried grated coconut, pours some water and salt over it and steamed it to get moist grated coconut. Cook sugar with water, add some vanilla sugar. Let it cooked. Mix the grated cassava with 1/4 kilogram grated coconut, and add the mixture sugar with water, mix until well. Divide the dough into 3 parts or more, add different colors as much as you want. Then use pasta machine to get the spaghetti form like the picture above then cut into 5 inch length. Serve with moist grated coconut that you have already seasoned with some salt.